Tired of searching for new or used office trailers? Well you are in luck because OfficeTrailerPros.com helps you find office trailers for sale or rent across the nation. If you are a construction company that needs extra room temporarily you can find weekly, monthly and long term office trailer rentals in many sizes and configurations to meet your needs. If your needs are more permanent, Office Trailer Pros can help you cut through the clutter of options and quickly find an office trailer for sale at the right price. Let OfficeTrailerPros.com be your consultant whether you need a small office trailer for a construction site complete with ramps & furniture or you manage a highway crew and need a mobile office trailer that is easy to transport every day. Best of all, we make sure that you can quickly find the lowest prices for office trailers for sale by giving you comparisons you can't find anywhere else. Construction Office Trailers - This is probably the most common application we see as construction companies are always in need of an on site solution that allows them to be both mobile and productive. You can find construction office trailers that are bare bones with no upgrades or fully stocked units with electricity, AC, wifi hookups, bathrooms and more. Healthcare Mobile Office Trailers - Healthcare applications vary widely but trend toward modular office trailers that can be combined to larger units that can hold more equipment and people. Healthcare often requires a larger and more comfortable environment than the typical office trailer customer will need. Semi Permanent Office Trailers - Many organizations find that a long term lease or an office trailer for sale will solve their need for extra space while allowing them to avoid the cost of traditional construction. Churches and schools are the most common environment where wheel-less office trailers can sit for years, yet be moved when necessary. Modern office trailer amenities mean that there is very little sacrifice in comfort when you choose a mobile office trailer vs. a normal building. How secure are the mobile office trailers from vandals or weather? This is the most important question to ask if you need to store expensive equipment or sensitive documents in your office trailer overnight. There are of course varying degrees of security starting with the door lock, and some will come with bars across windows. GPS tracking is now fairly common as well for newer mobile office trailers, so there is less risk of a unit being completely stolen. Break ins are usually the biggest concern however and many companies offer enhanced locking features, steel doors and more. What accessories are included with my office trailer and what do I need to acquire on my own? Straps for tying down your office trailer (wind and weather can damage unstrapped units) are included but sometimes you will need to provide your own door locks. Many construction companies who rent office trailers often prefer their own locks for accountability reasons. If you will be using electricity or running water in your office trailer then you will need to coordinate with local utilities for installation. What kind of insurance to I need to rent an office trailer? You will want to invest in a liability insurance program if you do not have one on your own in the event that there is significant damage to the office trailer or an employee is injured. Standard damage waivers are also provide good coverage for a relatively small charge on top of the cost of the office trailer rental. What size mobile office trailer will work for me? 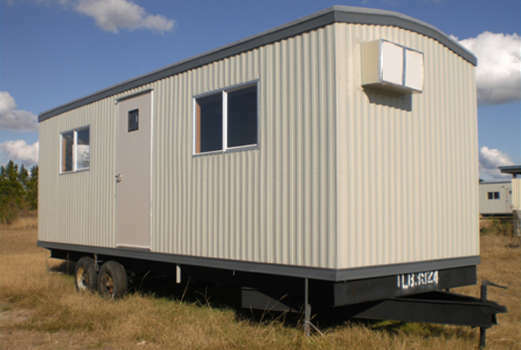 Office trailers come in a range of sizes to work in any environment. They are basically broken out by varying lengths (20 feet to 64 feet) and widths (8 feet to 24 feet). The most common widths are 8-10 feet which allow the office trailers to maintain their mobility and are more road friendly. The two most important factors when deciding what office trailer size will work in your case is how much internal space you will need to store items and work efficiently and how much space the property has for the placement of the office trailer. You will need to factor in extra room for the delivery truck to maneuver and place the office trailer properly.